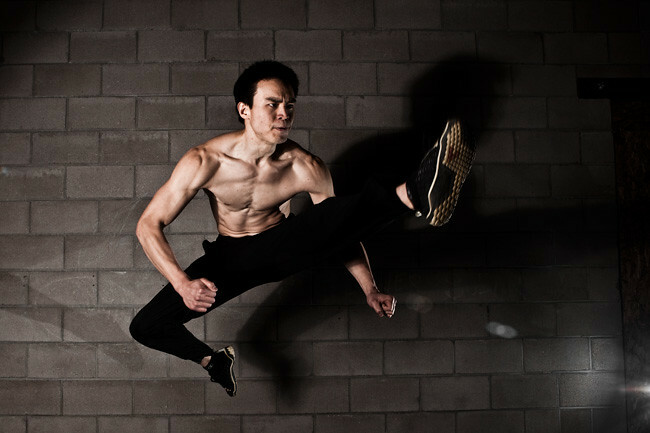 Dr. Kenneth Kao began training Parkour with Ryan Ford in 2004. He has been teaching at Apex since 2008, and is an establish authority in the Parkour community. Mark Toorock of American Parkour considers Dr. Ken to be Parkour’s Official Chiropractor, and in addition to working with several famous traceurs amongst which are Brian Orosco and Levi Meeuwenberg, Dr. Ken has been APEX Movement’s Team Doctor since 2008. He is frequently invited to speak at major events because of his unique perspective as both a Chiropractor and a Traceur, and he has been interviewed by Reuters, American Parkour, and many others. Besides running his clinic, Vital Balance Chiropractic (vitalbalancechiropractic.com), Dr. Ken is a professionally published author and he spends most his free time writing. He is also an avid pole dancer. You can follow his not-updated-enough tumblr at http://pkchiro.tumblr.com, where he posts his thoughts and adventures on Parkour, writing, pole dancing, health, as well as the occasional philosophical interlude.